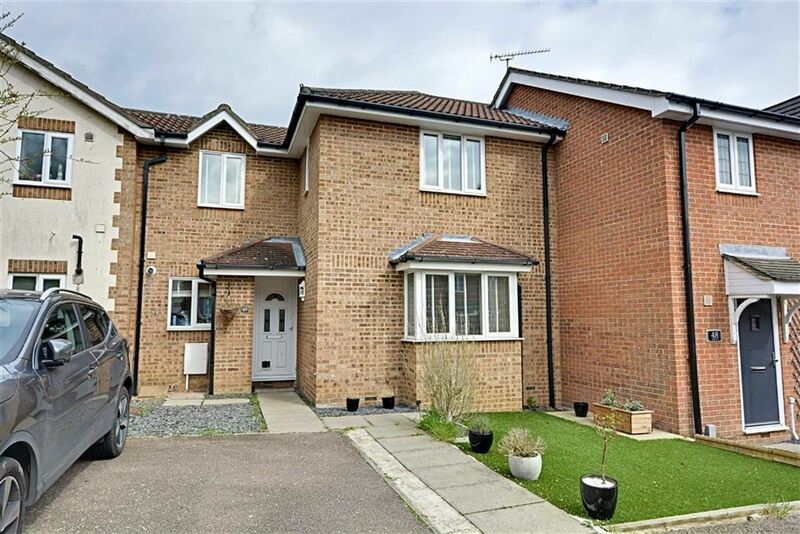 A TASTEFULLY AND WELL PRESENTED modern terraced house situated on the popular and highly sought after FOXHOLES DEVELOPMENT located on the east side of Hertford within easy access to the A10. With REFITTED MODERN KITCHEN and SPACIOUS 17' LIVING ROOM this fully double glazed and gas centrally heated home offers a fantastic opportunity for both first time buyers and investors. ALLOCATED PARKING directly to the front of the property with additional casual visitors spaces available. UPVC double glazed window to front, fitted with a range of modern style base and wall cupboards with contrasting work surfaces over incorporating single drainer stainless steel sink unit with mixer tap, metro tiled splash backs, tiled flooring, cupboard housing gas boiler, built in stainless steel oven with separate ceramic hob and filter hood over, integrated fridge freezer and washing machine. Dual aspect UPVC double glazed window to front and French doors to rear into courtyard style garden, wood flooring, stairs to first floor with cupboard under, coving, two radiators and television point. UPVC double glazed window to front, radiator, recessed cupboard with hanging rail and shelving. Opaque UPVC double glazed window to rear, extractor, recessed spot lights, chrome heated towel rail, low level WC, pedestal wash hand basin, panel enclosed bath with mixer tap and wall mounted shower attachment with folding glass screen, shaver point, tiled flooring and tiled walls in suite area. Paved courtyard enclosed by panel fencing. Allocated parking space for one car directly to the front of the property with additional casual visitors spaces available.